There are many differences between professional and amateur table tennis players. Some of them are timing, consistency, power, micro-adjustment, and tactics. To become professional in table tennis, in my opinion, micro-adjustment plays a role very important! So what is micro-adjustment in table tennis? How to become World Elite, Professional table tennis players? A small example of micro adjustment from Zhang Jike! Who is the greatest professional table tennis players? Micro-adjustment is very difficult to be observed. However, micro-adjustment will make you from a good table tennis player to a “very good” player. “micro adjustment” is the way you “tune” your technique to the superior level! Have you ever wonder why the top Chinese players (Zhang Jike, Ma Long, Fan Zhendong, Xu Xin, Wang Hao) are so strong versus the rest of another national Chinese players (second team, team B, Fang Bo, Zhou Yu, Yan An, Liang Jingkun, Sang Kun, Lin Gaoyuan, and about 15 more very strong top provincial players ) ? Look at the team: there are about 30 players in the closed training. However, there is always a big level gap between the top 4 players and the rest. So what makes the level gap? These national players are trained from very young ages (5-6-year-olds). They all have a very strong technical foundation and use the same equipment provided by DHS. They are trained in the table tennis elite school, under the same system. So what is the reason why the top 4 are very strong compared to the rest of the team? The reason is “tactics” & “micro adjustment”. To become better, or the best at table tennis, you should master “tactics” and “micro-adjustment”! All of top 4 players are coached by the personal coach. Good tactics provided by the personal coach will give the top 4 player many advantages in a long term. They quickly find good tactics to avoid the opponent strength and set up the game. The Top player can lose the 1st set versus a tough opponent, but quickly win other sets as they find a way to shut down the opponent strength and force the opponent to play his game. Personal coach ensures the best tactics in the critical situations in a match. Micro adjustment is very hard to be observed as it’s a small gesture, the feeling at the moment they hit the ball. It makes the Backhand of Zhang Jike, Wang Hao, Ma Long is different. Why is the Forehand of Ma Long so powerful, unable to block? Why is the Forehand of Wang Liqin so consistent? How is the Backhand of Zhang Jike so explosive? why is the Backhand of Fan Zhendong so fast? It’s all because of “micro adjustment”. The micro adjustment was first explained by coach Li Xiaodong. It’s based on the player’s feeling at the moment of contact: how to increase the speed, the spin of the ball? It comes from many years of training and under the eye of a good coach to discover it! Here I will show you a small example of Zhang Jike? I hope that you can feel this micro adjustment and find yourself a good “micro adjustment” to improve your table tennis. Can you see something? No, it’s too fast to be observed! This is the micro adjustment and very important as it’s the way of Zhang Jike prepares before doing an “explosive backhand flick” – his specialty, without this step his backhand is less powerful. There are many great pro players in table tennis: Ma Long, Zhang Jike, Fan Zhendong, Harimoto Tomokazu, Jan Ove Waldner, Hugo Calderano, etc. But for me, as explained in this article, the greatest professional player should be Ma Long. As for Forehand loop, Zhang Jike just loosens his grip a little before hitting, but at the moment of hitting, he holds the bat again and impacts the power. This “micro adjustment” for both backhand and forehand separates Zhang Jike from the rest of the world. Chinese coaching emphasizes the “quality of your shots”. Micro-adjustment is the key! 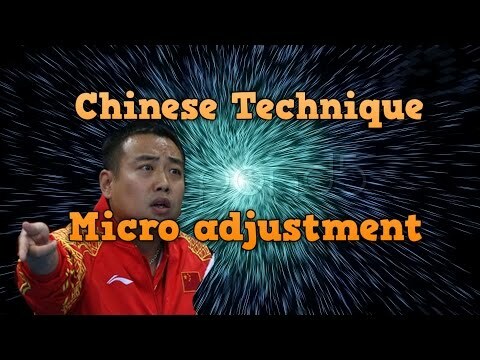 Micro adjustment can improve your table tennis: from a good to very good player. After finishing the stroke, Zhang Jike’s muscle is relaxed right away (Look at his grip). This makes Zhang Jike recover very fast. His muscle is very flexible but “quick response” and “explosive”. I just want to emphasize that the muscle should be relaxed all the time, and the muscle is tense only at the moment when you hit the ball. Professional do changes the grip after serving, or during the rallies! Look at Timo Boll for example! It’s one example of micro-adjustment! Flexible muscle of Zhang Jike is another example of micro-adjustment. Many of us, amateur players, after the stroke, our muscles continue to be too tense. It’s not good. It prevents you to feel the ball, the ball has less spin! Tense muscle makes you tire quickly! I hope this tutorial helps you understand the principles of table tennis! These advanced skills are crucial for any players who want to become professional in table tennis.